BRISTOL - Rhode Island could already be the team to beat in the New England portion of the Little League Eastern Regional Tournament after just two games. 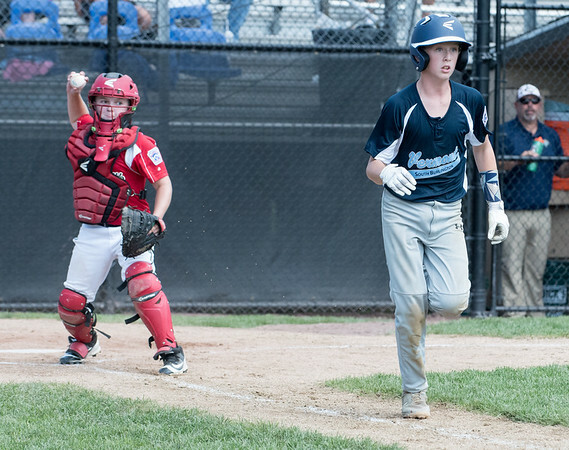 The win over Vermont Monday afternoon made it the second consecutive 10-0 victory in games shortened by the 10-run mercy rule after defeating Connecticut in the first game Sunday at Giamatti Little League Center. Shutdown pitching and a dangerous top of the order has been the driving factor behind Rhode Island’s scorching start. After Turner went four scoreless on Sunday with six strikeouts, it was Jake Mather’s turn Monday. Mather pitched 4 2/3 with eight strikeouts. Turner and Mather are the 1-2 punch on the mound for Rhode Island with Logan Lama also joining the mix. Lama pitched in relief of Mather recording one out with a strikeout of Andre Bouffard to end the game. With the pitching flawless, the offense has been just as impressive through two games. The top of the batting order is a strength of all teams at this time of the summer, but Rhode Island’s first four hitters have been on another level to begin the tournament. Tyler Simon, Turner, Mather and Lama have combined for 13 of Rhode Island’s 19 hits in the tournament and driven in 11 of the team’s 20 runs. The four have also scored 14 of the 20 runs. Against Vermont Monday, Simon started the game off with a long at-bat to draw a walk. Turner followed it up with a single and Mather drove in Simon for the first run of the game. It was the start of a powerful day for the four hitters. Simon finished 1-for-2 with a pair of runs scored and a RBI. Mather and Lama each went 2-for-4 with a run scored. Lama drove in a pair and Mather added a RBI. Turner finished with a 3-for-3 day with two runs scored and a RBI. While the top of the order is a big strength for Rhode Island, Sammy Fuentes made a name for himself out of the No. 8 spot in the order against Vermont. Fuentes finished 2-for-3 with a team-high three RBI and a run scored. With the second win, Rhode Island will take on the winner of Maine and Massachusetts on Wednesday at 4 p.m.
Posted in The Bristol Press, General Sports on Monday, 6 August 2018 21:01. Updated: Monday, 6 August 2018 21:03.